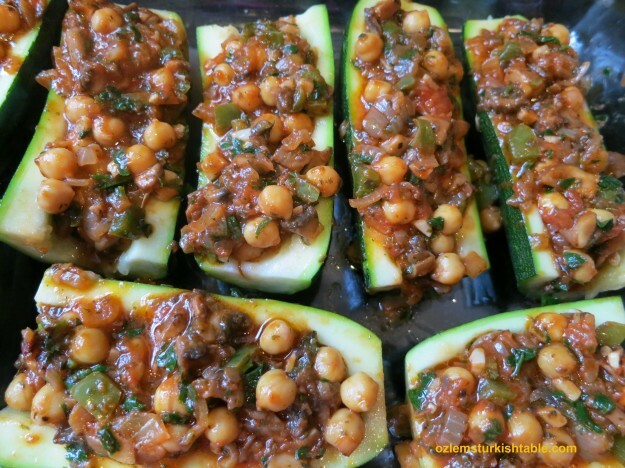 I previously made the delicious stuffed zucchini halves with ground meat, vegetables and chickpeas or garbanzo beans, inspired by my home town, Antioch’s (Antakya) cuisine. 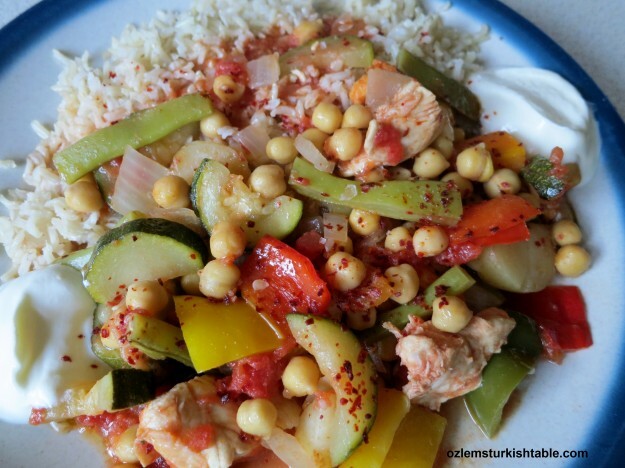 I was asked for a vegetarian version of this dish during my Turkish cookery class past Saturday and there came this delicious dish. The meaty mushrooms, onions, peppers made a scrumptious filling and worked so well with chickpeas. With a touch of heat by the Turkish hot pepper paste, biber salcasi & Turkish red pepper flakes and the refreshing dried mint, we had an at least equally delicious vegetarian stuffed zucchini that we all very much enjoyed. 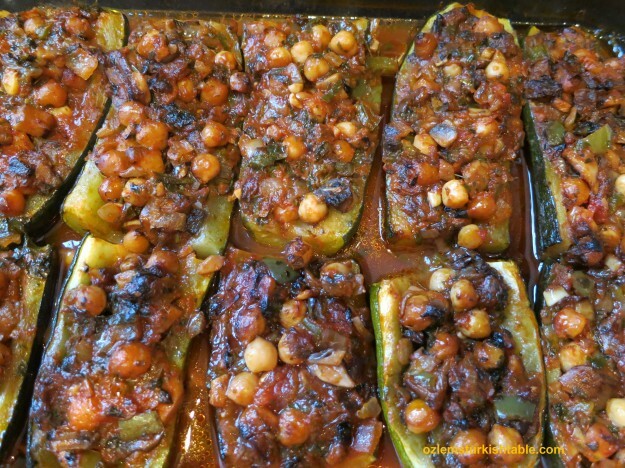 I also used a little pomegranate molasses, nar eksisi, to add a delicious sweet & sour taste to the zucchini halves. Pomegranate molasses is used a lot especially in Southern Turkish cuisine in salad dressings like in this Gavurdagi Salad of tomatoes, onions and walnuts or in bulgur wheat salad, kisir; a little bit of it adds a great punch. You can prepare this healthy dish ahead of time and the leftovers freeze beautifully. Please save the flesh of the zucchini or courgettes that you scooped out. They are delicious & wholesome cooked with onions, tomatoes & dried mint in this bulgur pilaf . Cut the zucchini in half and then in lengthways. Using a dessert spoon, carefully scoop out some of the flesh to create a cavity that is large enough to stuff the filling (Please save the flesh of the zucchini that you scooped out. They are delicious cooked in bulgur pilaf). Mix 2 tbsp. water with the pomegranate molasses (if using) and wash the inside of the courgettes with this mixture; this adds a delicious sweet & sour taste to the zucchini. Heat the oil in a heavy pan. Stir in the onions and garlic and cook until light golden. Add the mushrooms, bell pepper and hot pepper paste (if using). Season with salt and pepper and sauté for about 5 minutes. 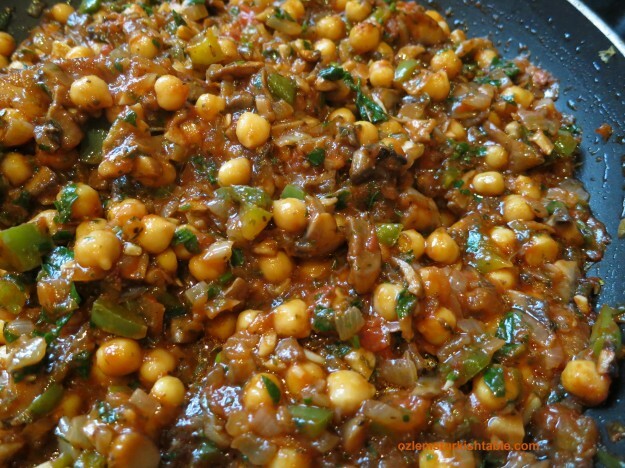 Stir in the chopped tomatoes and the cooked chickpeas, mix well. Add the red pepper flakes and the dried mint, combine well. Cover and cook for another 10 minutes. Turn the heat off; the filling is ready. Take a spoonful of the filling and stuff the zucchini halves. Grease a baking tray with 1 tbsp. olive oil and place the scooped zucchini. Take a spoonful of the filling and stuff the zucchini halves, taking care not to over fill them. Dilute the tomato paste with the water and pour on the tray. Cover and bake in the oven for about 25-30 minutes. After this, uncover and bake for a further 10 minutes for a lightly brown finish. While the zucchini halves are baking, prepare your garlic yoghurt. In a bowl, mix the plain yoghurt with the chopped garlic. Serve the stuffed zucchini hot, with the garlic yoghurt by the side. You can make this wonderful bulgur pilaf using the flesh of the zucchini we scooped out; they complement each very nicely and you get a complete meal. Indeed Istanbul is calling and I can hardly wait! 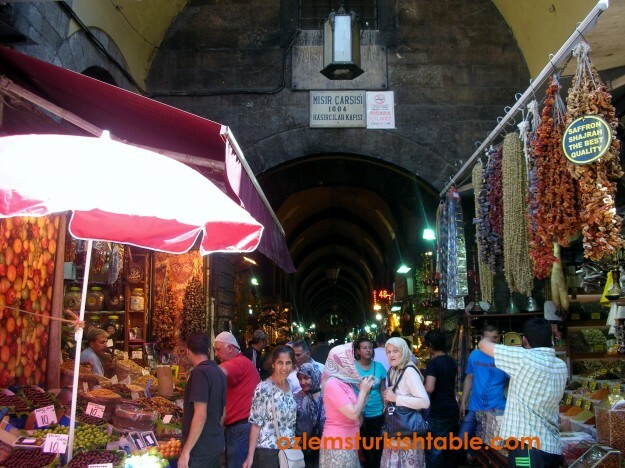 I will be in Istanbul next week, the city that makes my heart beats fast, a feast to all senses. Greatly looking forward to seeing family, friends and feeling the beat of this fascinating city. 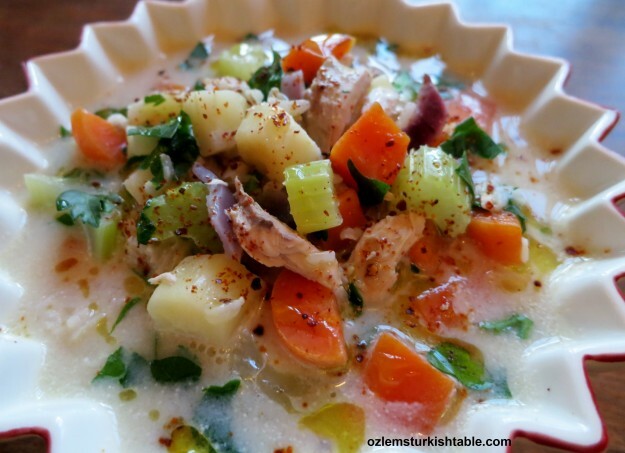 I also very much look forward to sharing delicious Turkish cuisine with food lovers at my Turkish cookery class on Wednesday, 19th February at the Istanbul Culinary Institute. I will be in touch soon with delicious memories from home! Cold winter days call for a warming meal; this delicious chicken and vegetables soup is ideal to turn the left over bits of vegetables and cooked meat (you can meat omit for a vegetarian option) into a hearty, delicious soup. With nice crusty bread aside, this chunky soup makes a complete meal for us (and just the thing if you have a cold). 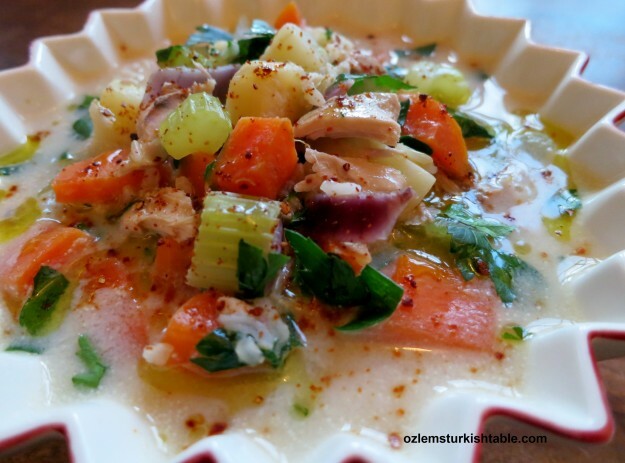 Soups, Corba as we call in Turkish, have a special place in Turkish cuisine and the meals mostly start with a soup. 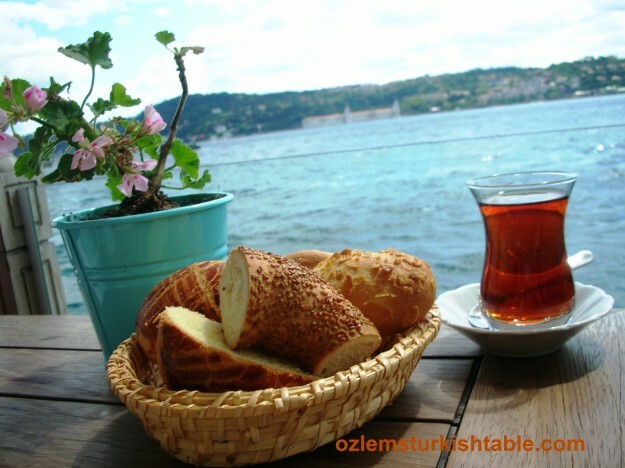 In Anatolia, it is very common to have soup to start the day, especially in winter. There is a special technique used in this soup; lemon juice is beaten with egg yolks to thicken the sauce and add a delicious sort of tangy flavor. 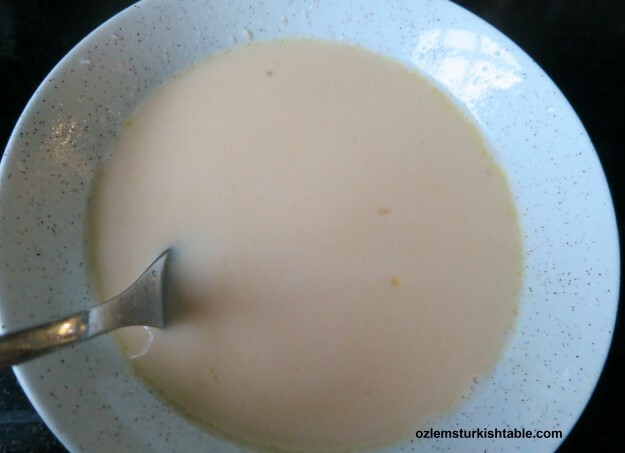 This method is called “terbiyeli” in Turkish cuisine and it requires a staged tempering of the egg sauce into the hot liquid, so that the soup won’t curdle. I have used parsnips, celery, carrots, red onion here; you can also use potatoes, regular onion or any other vegetables you like and needs finishing. I hope you enjoy this delicious, nutritious, warming soup. Heat the olive oil in a deep heavy pan and stir in the onion, sauté for a few minutes. When the onion begins to color slightly, toss in the celery, carrot and parsnip. Stir and cook for a further 2 minutes. Then add the rinsed rice, giving a good stir. Pour in the hot stock or water and the cooked chicken pieces (if you are using), combine well. Season with salt and freshly grounded black pepper to your taste. Cover and cook over medium to low heat for about 20 minutes or until the vegetables are cooked though still have a bite to them. Gently pour in a ladle of the hot soup to the egg mixture and blend well. Afterwards, in a small bowl, thoroughly blend the egg yolks with the lemon juice. Gently pour in a ladle of the hot soup to the egg mixture for tempering and blend well. Then slowly pour this egg mixture into the simmering pan; stir constantly so that the eggs don’t curdle. Add the chopped parsley and cook the soup very gently on low heat for 3-5 minutes. Do not allow the soup to boil, or it may curdle. Check the seasoning and turn the heat off. 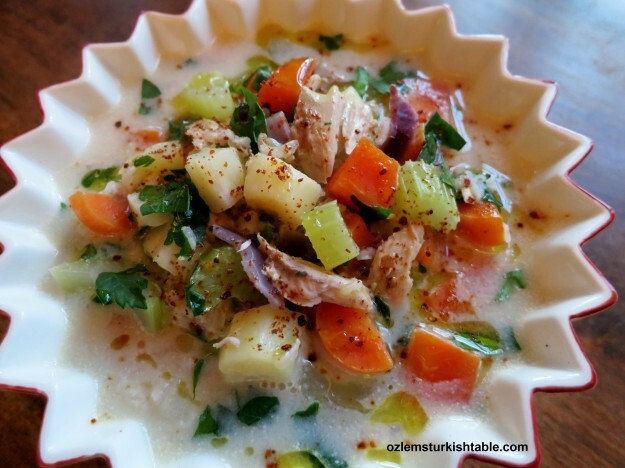 Warming chicken and vegetables soup in lemon & egg sauce. Ladle the soup into individual serving bowls. Drizzle a little extra virgin olive oil over and sprinkle red pepper flakes, pul biber over, if you like. Serve hot with some crusty bread and a wedge of lemon aside. I was delighted to take part in Dunyanin Turk Sefleri, “Turkish Chefs of the World” TV program on TRT Turk TV Channel. I was delighted to be involved in the Turkish Chefs of the World, “Dunyanin Turk Sefleri” TV program aired on Turkish National TV, TRT Turk channel (aired over 70 countries) a few weeks ago. 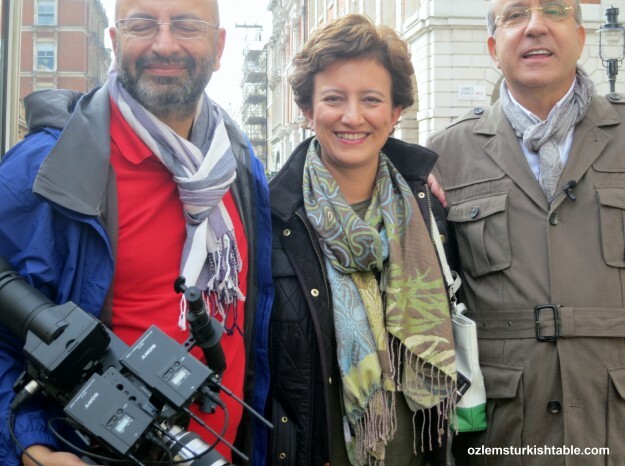 The program was shot in major gastronomic centers like New York, Berlin, Tokyo, Vienna, Paris and London, exploring world cuisines and the presence of Turkish cuisine around the world. I was involved in their London program; the presenter and Milliyet food author Mr. Sureyya Uzmez and I talked about the vibrant London food scene and the growing presence of Turkish cuisine abroad. I delightfully mentioned the increasing global interest for the healthy, delicious Turkish cuisine and my admiration for your enthusiasm, dear readers, to learn and tackle many aspects of Turkish cuisine, from baklava to Simit, karniyarik to Turkish Delight and more. The interview is in Turkish but I thought you may still enjoy viewing, here is the YouTube link for the program (my part starts as of 2.30 minutes onwards). Hope you enjoy it! Tangy, refreshing lemon, packed with goodness. 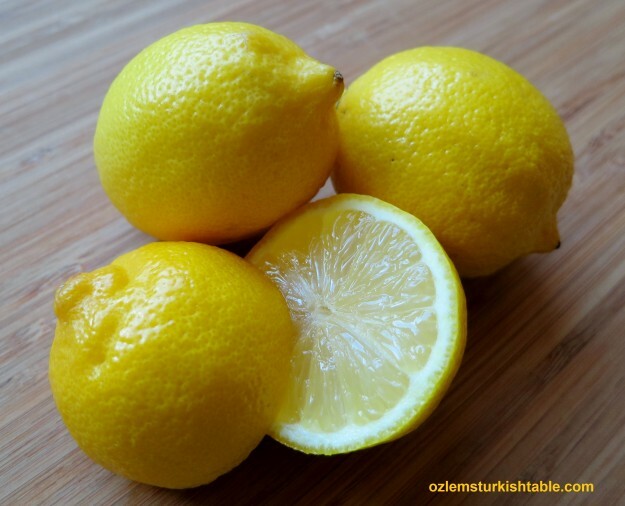 I am a huge lemon fan; love its refreshing, tangy flavor and lemon is a welcome addition to most of the dishes I enjoy. My dear friend Hande knows my soft spot for lemons and she made us a delicious chicken course using this lemon pepper blend while we stayed with them in Houston. It was my first time to try this blend and I greatly enjoyed it. Lemon pepper spice blend; delicious on fish, poultry and vegetables. Lemon pepper blend consists of good sea salt, freshly ground black pepper, lemon peel, garlic and onion. It is wonderful on fish and equally as good on chicken, turkey and vegetables. The spice store Penzeys have it; alternatively, you can also make your own. Baked chicken with summer vegetables and lemon pepper; a delicious main course you can prepare ahead of time. Hande kindly gave me some extra lemon pepper seasoning and we recently made this delicious baked chicken with summer vegetables. 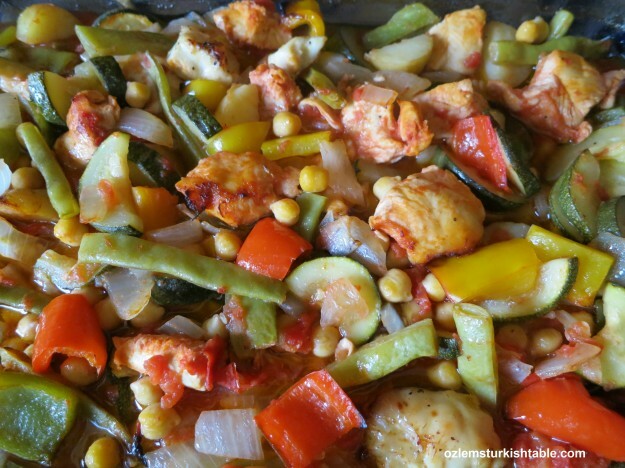 Runner beans, or string beans or taze fasulye are in season until about October and they are delicious in this dish. Peppers, zucchini, tomato all worked well here with the tangy lemon pepper. 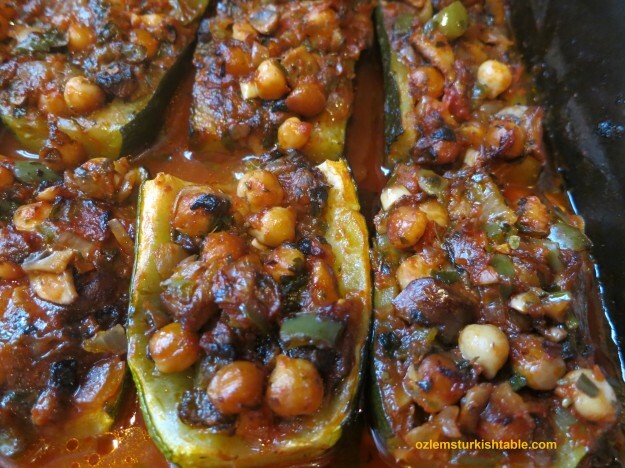 I also added some cooked chickpeas here, as commonly used in Southern Turkish cooking, like in this stuffed zucchini/courgettes with ground meat, tomatoes, onions and chickpeas recipe. It turned out to be a wholesome, delicious meal, (late) summer on a plate. An easy, wonderful casserole you can prepare ahead of time and leftovers freeze very well. To make your own lemon pepper; combine the lemon zest with sea salt and freshly ground pepper, ready to season the chicken (I didn’t add garlic and onion to this blend, as I used plenty onions and garlic at the chicken bake). In a bowl, combine the lemon pepper, lemon juice and olive oil and rub this mixture to the chicken pieces, mix well. Cover and keep in the fridge for at least 30 minutes or so that the flavors can blend. 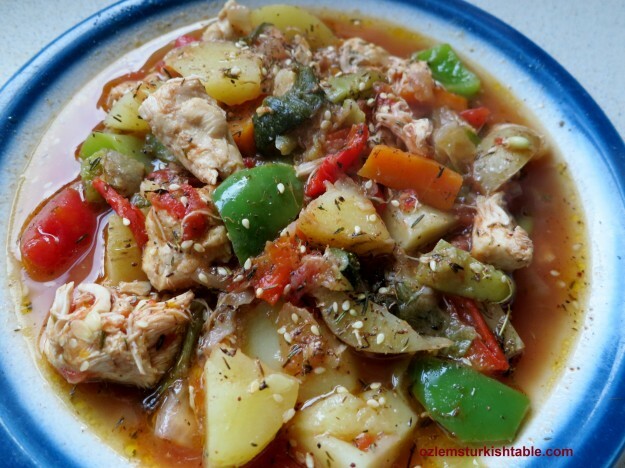 Summer on a plate; runner beans, peppers, tomatoes, zucchini taste delicious in this chicken casserole. 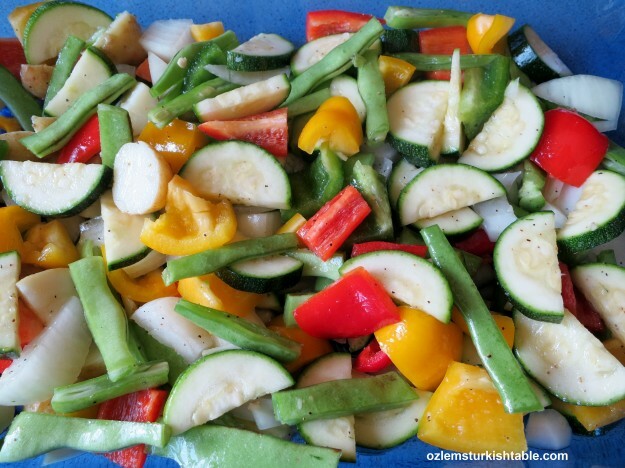 While the chicken is marinating, prepare your vegetables. Top and tail the beans and pull away any strings and cut into 3-4 pieces. I also like to cut them in half into thin strips. Combine the rest of the vegetables in a baking dish, stir in the olive oil and season with salt and freshly ground pepper. Place the marinated chicken in a heavy pan and sauté for 3-5 minutes to seal their juice. Turn the heat off. Stir in the sautéed chicken to the vegetables mix and add the chopped tomatoes and water. Give them all a good mix. Bake in the pre-heated oven, uncovered for about 35 minutes. About 35 minutes later, stir in the rinsed, cooked chickpeas to the mixture, combine well. Bake for another 10 minutes or so, until the chicken and vegetables starting to turn nicely golden brown on top. If you like a little heat like we do, sprinkle some Turkish red pepper flakes, pul biber on the finished dish, just before you serve. Here is my plate! This baked chicken with vegetables make a delicious, complete meal with plain rice and natural yoghurt by the side. You can serve your baked chicken with summer vegetables with plain rice and natural plain yoghurt aside. Cacik, the cucumber yoghurt dip with mint would also be a delicious accompaniment. 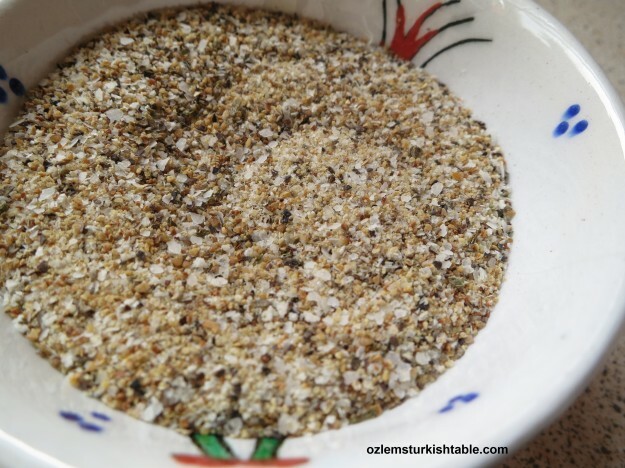 Aromatic Zahtar blend of sumac, wild oregano, sesame seeds and more; it adds a lot of flavor to vegetables, meat and poultry. 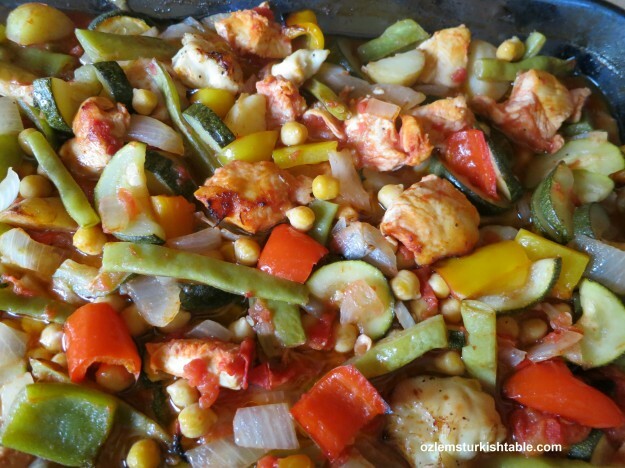 Recently, we also enjoyed this chicken and vegetables bake with the aromatic zahtar sprinkled over too. Za’atar is an exotic blend of herbs, spices and nuts, widely used in Southern Turkish as well as Middle Eastern cooking. At my home town, Antakya, zahtar blend is a rich mixture of dried zahter, sesame seeds, crushed cooked chickpeas, cumin, nigella seeds, sea salt, sumac and many more. It has a lovely, pungent, nutty taste and flavors salads, meat, and vegetables beautifully. Here is more information on zahtar and how to make your zahtar blend at home.